Did you know? 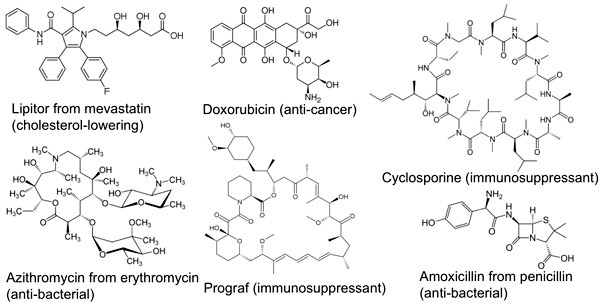 Molecular structures of some mainstay drugs – directly isolated, or based on, microbial natural products. Image courtesy of Oregon State University. Download image (jpg, 58 KB). In the last 25 years, over 50% of all new chemical entities approved as drugs were based on a “natural product“. Natural products are produced by living organisms as part of their “secondary metabolism“; secondary because these small organic compounds generally are not required for life-sustaining primary processes such as respiration or synthesis of biological macromolecules like DNA, proteins, lipids and carbohydrates. Nevertheless, many secondary metabolites are important to the survival of organisms, behaving as a prolific chemical arsenal that allows them to compete with each other. These compounds are diverse and structurally complex, specifically evolved to bind cellular targets, and often to penetrate or dismantle cell membranes. These characteristics make natural products a good source of potential new medicines. Organisms at hydrothermal vents with unique forms of primary and secondary metabolism represent an untapped potential source of new types of natural products with new biological mechanisms of action. Why are natural products from diverse and unusual living organisms important? The escalating problem of drug resistance, especially in the treatment of cancer and infectious diseases, makes it urgent to replenish a dramatically reduced drug pipeline, especially for antibiotics. Diverse, phylogenetically unique organisms that have alternative primary metabolic pathways, such as those supported by chemical energy (chemosynthesis) at hydrothermal vents rather than photosynthesis (energy from sun light) represent an untapped potential source of new types of natural products with new biological mechanisms of action. Therefore natural products chemists have begun to evaluate recently discovered deep-sea vent organisms as a source of small molecule natural products with medicinally-relevant properties. For this exploratory expedition, we will rely on studies of the biology and water chemistry of the targeted vent fields to plan our collections. 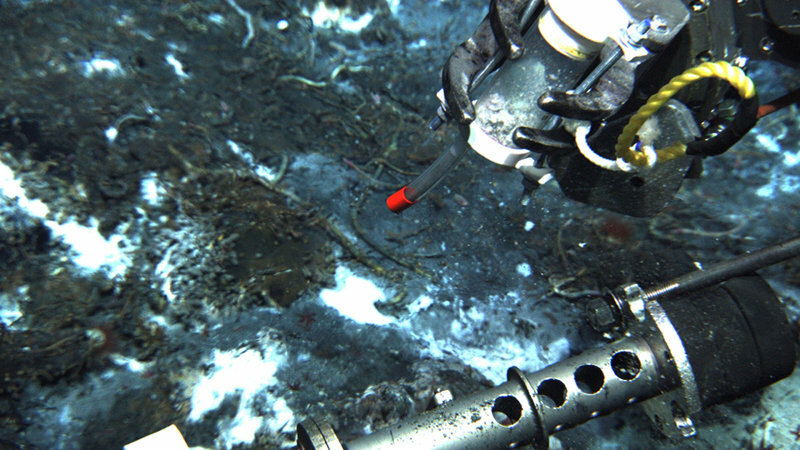 Syringe sampler used by ROV manipulators to collect microbial mat samples. Image courtesy of NOAA / NSF / WHOI. Download larger version (jpg, 2.3 MB). Which organisms should we collect and how? Diverse invertebrate vent communities consist of arthropods (crustaceans), mollusks (e.g., clams) and annelids (worms) as well as cnidarians, chordates and sponges. A variety of evidence indicates that the majority of these invertebrates don’t actually fix carbon themselves, but can acquire it by hosting symbiotic microbes that use chemical energy to convert carbon dioxide, methane or other available organic compounds into usable forms of organic carbon. In addition, plumes of water rising above the hydrothermal vents contain extremely diverse chemosynthetic bacteria and archaea with cell densities several orders of magnitude higher than surrounding seawater. These free-living microorganisms also form microbial mats on the surface of basalt, chimney spires and within hydrothermal sediments. 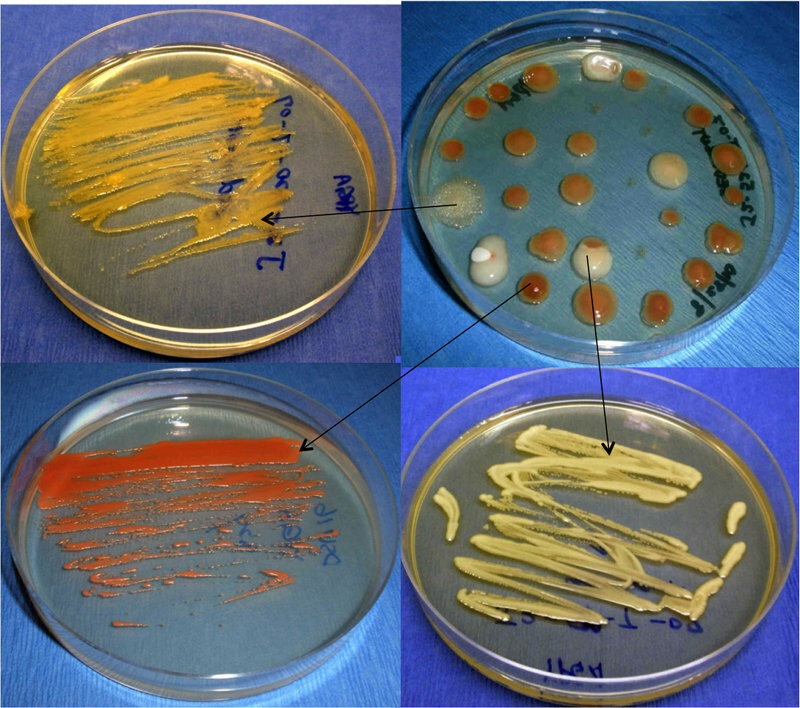 Laboratory cultures of deep-sea vent microbes: isolation and purification of organisms on solid agar media. Image courtesy of Oregon State University. Download larger version (jpg, 927 KB). We focus on accessing natural products from deep-sea vent microbes, using two approaches: we isolate and culture the micro-organisms and use gene sequencing of DNA from the samples collected in the field (“environmental DNA“) to confirm that our cultures are from the deep-sea and not from contaminants, and we also check organisms that cannot be cultured for potential biosynthetic genes. How do we get pure, biologically active compounds from the organisms collected? The natural products can be extracted from our field collections and cultures using solvents. The individual chemicals that are now in the solvent can be separated from one another using a process called high performance liquid chromatography (HPLC). Each of the compounds (sometimes more than one) can be seen as a peak by a detector. We can collect these peaks and conduct analyses of them using a variety of techniques including absorption of UV light, mass spectrometry, and nuclear magnetic resonance (NMR). This process produces a chemical profile that enables rapid identification of known or potentially new types of chemical compounds. A biological profile is also obtained for each peak by testing for antimicrobial activity and biofilm interference against key test organisms that cover a broad spectrum of activity including Gram-positive, Gram-negative, and eukaryotic microorganisms, including clinically-relevant human pathogens. What next for medicinally-relevant new natural products? When a new natural product with significant biological activity is identified, additional quantities of it must be obtained for complete characterization of the natural product’s molecular structure, and for additional biological testing, including toxicity and in vivo activity. This means growing up much larger quantities of a laboratory-cultured producing organism, or even returning to the site of original field collection. Alternatively, chemical synthesis of a proposed molecular structure may be undertaken, although structurally complex natural product molecules may require years to synthesize successfully.